I can’t recall reading a history book with such pleasure in a long time. 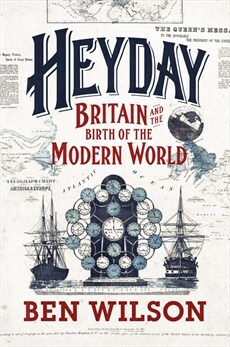 Heyday is the kind of chronicle I wish had been available when I was a student and right now I’d advocate should be placed on the curriculum for all students of British and World history. It covers the British ‘Heyday’ of world dominance of economic and political power from 1850 to 1862. From the gold rush in Australia and the explosive growth of Melbourne to the opening up of China (by force) and Japan by negotiation and the Indian rebellion, it is remarkable in that in reading this one is acutely aware that the world is still reverberating from all these events 170 years ago. The collapsing of distance and speeding up of the world is the critical momentum that drives the narrative. From the fast clippers that made Australia just 70 days away from England to the discovery of gutta percha (latex), that allowed copper cables to be wrapped and impenetrable to salt-water erosion and so led to the electric telegraph eventually encircling the globe. News and information drove the world economies and the faster you could get it the better and richer you could be. (There was a Mr Reuter who saw this most clearly and based himself in London, then as now, the centre of the economic world.) In other words this was the decade that technology for good or evil came to the fore, rapidly took hold and from henceforth took the driving seat in ‘civilisation’. It was also the decade that some were aware that the less fortunate would lose out. American showman George Catlin called for a Museum of Mankind to record for posterity the peoples facing oblivion. ‘The march of civilization is everywhere, as it is in America, a war of extermination, and that of our own species’. Deforestation in North America took place on a devastating scale. Such was the demand for timber for rail and housing worldwide, men and their axes penetrated deep into precious forests and felled everything, not giving any heed for 1000 year old growth, never thinking of the future or posterity or planting anew behind them. Men grew rich on land speculation and were just as easily ruined if the railways chose another route. All financed by London seemingly without any caution or reflection on the viability of proposed towns and cities drawn on speculators maps. There are many things to be embarrassed about in our British imperial past. The way China was forced to open up to trade and opium, the looting of priceless artifacts, the terrible retribution for the Indian uprising (driven as ever by a rabid press at home) and the fatal hesitation as to which side to back in the American Civil war, even though the population at large were definitely against the evils of slavery. The horrible irony of British entrepreneurs seeking to keep the cotton flowing to the Lancashire mills and by-pass the slave owning Confederate monopoly, promoted the growing of cotton all over the world and inadvertently enslaved huge sections of populations by default in countries all competing for this fantastic trade. New Orleans loss was Bombay’s gain. The decade began with the Great Exhibition in Crystal Palace – a time of hope that free trade and enterprise would bring peace to the world and ends with war and protectionism and a rising Germany that would eventually come to plague the 20th Century as Britain’s main rival for world trade. Heyday gives us a comprehensive grounding in how the Empire worked and why it is existed. It offers us an understanding of attitudes and the sheer exuberance of those times without bogging us down in the minutiae of politics. It was a time for heroes (even if they had decidedly clay feet) and how the native populations of America, Australia and Asia were essentially conceived as hindrances to progress. Yes it is sometimes brutal, but these were not politically correct times. For students needing a safe space and nothing too challenging for their health and safety mindsets this book might come as shock. History is shocking, but also electrifying and Ben Wilson writes with an easy accessible style that fills in all the gaps from our rather pedestrian history curriculum. He makes early Victorian history relevant to our modern times and that is no bad thing.